A team led by Andrés Muñoz-Jaramillo from the Southwest Research Institute integrated a sunspot drawing made by Hevelius in 1644 with images from NASA's Solar Dynamics Observatory. The variation of observation techniques comes through in the image. 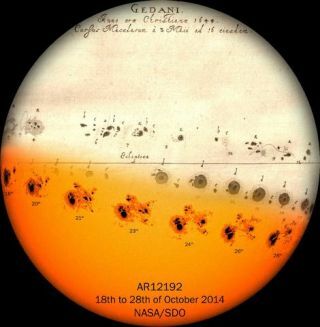 In an effort to better grasp the sun's past, present and future, Colombian and Spanish researchers made visualizations that meld the last 400 years of recorded solar observations. This average-size display of solar activity occurred on Dec. 5. Pictured here, via ultraviolet light wavelength, is a part of the sun's southern hemisphere with several magnetic loops. As the sun continues approaching solar minimum, fewer active regions will appear. This week, data from the spacecraft Voyager 2 confirmed its exit from the heliosphere, the sphere of influence of the sun's radiation surrounding the solar system. The heliosphere is made up of the sun's magnetic field and the particles it has charged, and it protects the planets within it from incoming cosmic radiation. The sun's regular, roughly 11-year cycle leaves an impact on the bodies within its sphere of influence, according to the new study. During the cycle's quiet period, known as solar minimum, Earth's outermost atmospheric layer can shrink. This, in turn, can cause a lingering of space junk that poses a threat to orbiting spacecraft. And during the sun's opposite season, called solar maximum, sunspots and flares increase in number, producing powerful solar storms that can disrupt communications systems and even cause a blackout. "The sun has seasons like Earth in some sense, where you have periods of a lot of activity and periods of very little activity… we call that space climate," Muñoz-Jaramillo said. Muñoz-Jaramillo used earthly weather events, seasons and oscillations like El Niño in his description of solar activity. Historical (left) versus modern (right) observations of sunspot groups. Observing the sun is an ancient human practice; the creation of deities like the sun god Ra from Egypt and the sun goddess Saulė from the Baltics are early examples of societies' interest. People still observe holidays like Christmas (Dec. 25) and Inti Raymi (Jun. 24), which occur near the winter solstice to celebrate the start of a new year (the different dates correspond to different hemispheres). So when people invented telescopes, it's no surprise that the sun became one of the tool's prime subjects. But observations taken centuries ago aren't exactly like the ones taken today. To compensate for that, the team streamlined the data to gain a clearer picture of how the sun is moving through its cycles. "When you try to understand what the sun has been doing for the last 400 years… you have to start using drawings," Muñoz-Jaramillo said. "You have to start using sunspot calendars that were made 400 years ago, 300 years ago, 200 years ago. Since people didn't understand exactly what they were seeing, the way [that] they were making all of these measurements was different… and so it is really hard to put them together." This visual, created by scientists Andrés Muñoz-Jaramillo and José Manuel Vaquero, offers a new way to look at where there is unreliable or little solar data over the last 400 years. Muñoz-Jaramillo said he hopes the team's visualizations, which include measurements by 17th-century astronomers Johannes Hevelius, Christoph Scheiner, Galileo Galilei and others, show where future researchers should be careful in making conclusions. One set of observations that still puzzles scientists comes from the Maunder Minimum, a period of low solar activity that lasted 70 years, from about 1645-1715. While the Maunder Minimum is a potential "archetype" for a phenomenon called the grand minimum, these observations are less reliable than today's information on the sun, making evolutionary dots harder to connect. Muñoz-Jaramillo added he hopes their work makes all this older data (and its appropriate context) much more accessible to those studying long-term solar variability. The new work was detailed Monday (Dec. 10) in the journal Nature Astronomy.